Once Upon a Learning Adventure: Schools Out!! Yippee! And planning ahead! Okay, my first official week of summer is over, and I had a blast! I decided to take a mini-break from all things teaching (including blogging), and I had lots of fun just being a mommy for a while! Miss Elliotte and I went to the childrens' museum, story hour at the library, played in her baby pool, and just hung out! We also tried some pinterest-inspired activities, and I have to say, we both loved the kool-aid playdough and edible fingerpaints! (well, we liked playing with them--we didn't actually eat them--I'm not that fun of a mom!) The links for them are below if you're interested. I might try them with my firsties this year, too! I guess all that fun time playing gave me some new creativity because I just cannot stop thinking about things for next school year! This is what I just finished today, and I'm very excited to share it with you! I normally have my kiddos do an All About Me Bag as a community-builder for back to school, and I finally came up with a way to snazz it up a bit (other than the usual magazine collages)! 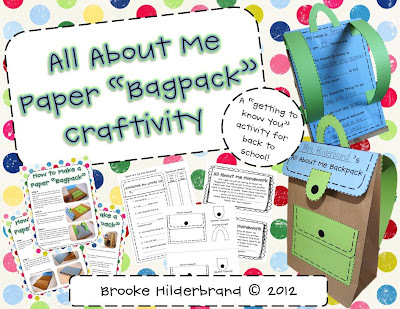 Introducing, the All About Me Paper "Bagpack!" It has questions for the kiddos to fill out on the back, and they will put small items such as toys and photos that represent them inside the bag. I'm also thinking about having them draw self portraits--maybe Flat Stanley-style--to put in the little front pocket. We'll share our bags during one of our class meetings, and then we'll display them for Back to School Night! I'm so excited I won't have to scramble for a last minute idea for that this year! Yay! If you'd like to check it out, just click the pictures! Oh, and if you are one of the first two people to comment with your email, I'll send it to you for free! I hear Miss E is waking up from her nap, so its baby pool time for us! Have a great rest of the day! This is super cute! It'll make our me bags so much more exciting! Well I missed being the first two as well but simply had to tell you how adorable and creative those are! We do all about me bags too, but this outdoes my little sticker on a paper bag! Very cute!! I have to admit the rainbow colors of organized playdough brought me to this post :) What amazing ideas!! What cute backpacks! I love it! I just found your TPT store and your blog. I love it all. So pretty!!! These are all great ideas! I can't wait to try them out in my room! I LOVE these ideas! In fact, my son came home yesterday from summer school with a ball of Kool-Aid play dough that he had made in his "how to be a better babysitter" class. :) Unfortunately, the dogs thought it smelled really good and they ate it. :( So, I'm really glad to have this resource to help me make some more! Just found your blog, great ideas!! Oh my how cute! This is my first day on Pinterest! How do I get a copy of this backpack? I just LOVE the bagpacks. So very clever. If you don't mind sharing, what program do you use to make all of these adorable things? WOW! That probably would have been my last thought. I'll have to play around with that a bit. Hi! I love your blog!! You have some very creative ideas! I have a question about how you made one of your products! I was wondering if you could email me at gingersnapstreats@gmail.com! =) Thank you! I am definitely trying the playdough and finger paint ideas with my first graders this fall. I'm so glad I found your blog. These are great ideas! I'm your newest follower.